Happy Holiday season. It is a festive time with holiday parties. There could be a wine or other liquid spilled on your carpeting. We will give you some tips to clean your existing carpeting at the end of our blog. If your flooring is looking old, has stains or is worn you may be wondering if now is a good time to consider replacing flooring in some of your rooms. Do you want new carpeting to make your rooms warm and cozy? Or perhaps Luxury Vinyl tile (LVT) which is the most versatile flooring available. Stainmaster®’s PetProtect® line is the best choice of carpet for homes with pets. 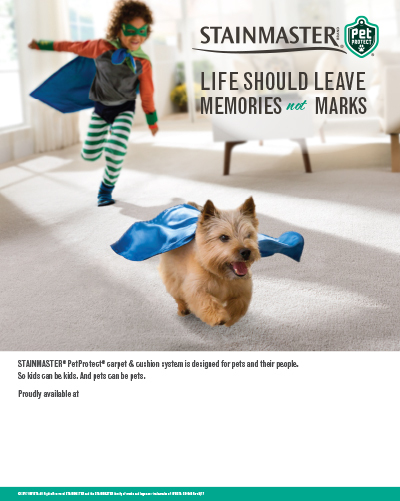 Stainmaster® the leaders in carpet stain protection have developed PetProtect® Nylon Carpeting that is designed to prevent carpet stains with stain-resistant nylon. Luxury Vinyl Tile (LVT) is the fastest growing segment in the flooring industry for many reasons. Many styles of LVT looks like wood so much so that you really have to look at it closely to determine if it is LVT or wood. You can also purchase LVT that looks just like tile. LVT is a very versatile product and can be used in any room in the home. The newest LVT product has a water proof core. This is very popular for bathrooms and kitchens because it is water proof and you can just wipe up spills without worries. It is also becoming very popular in businesses because of its versatility. At Coventry Flooring we build upon your dreams and provide you with great looking rooms for your home. We come out to your home with our mobile showroom or you can come into our showroom, with an appointment, to get ideas for your flooring installation project. Coventry Carpets guarantees their installation and takes pride in their work. Our design consultants have extensive knowledge and can help guide you through the different types of flooring options and the pros and cons of them in specific rooms in your home. We are one of very few flooring companies in Denver that actually do their own installations for carpeting and luxury vinyl tile. When wine is spilled on your carpet get a clean rag and put it over the spill and apply pressure to blot up the wine. Keep blotting the wine up with clean towels until you cannot absorb any more wine. Then get a damp cloth, with cold water so the stain does not set in, and blot until no more is visible on the towel. Detergent solution: Mix 1/4 teaspoon mild liquid dish soap with one cup warm water. Vinegar Solution: Mix 2 tablespoons white vinegar with 4 cups warm water.